An Organized Kitchen Pantry is what we all dream about, it doesn’t matter if it is a closet pantry or just couple cabinets, we all dream of being able to find anything we need instantly. 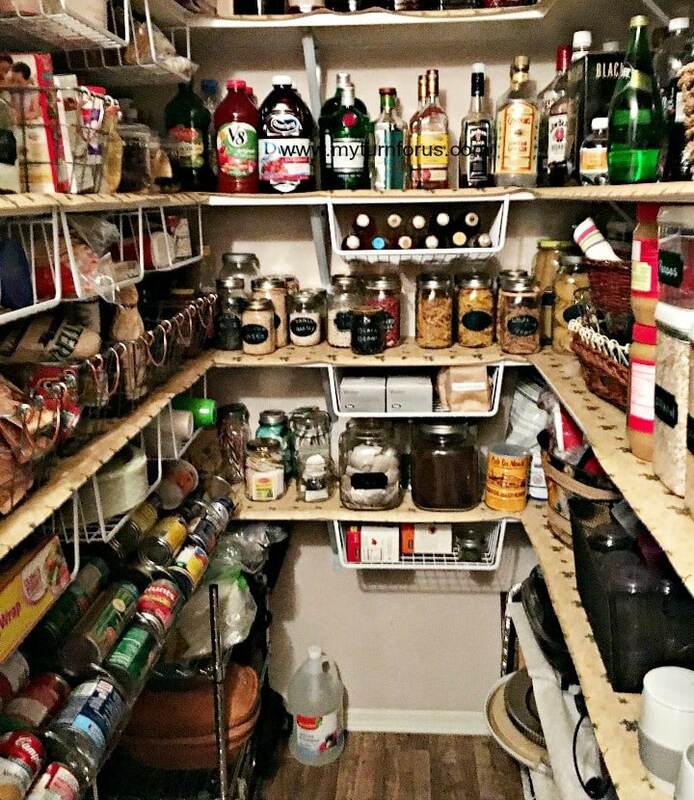 Here are some tips and tricks to organize your kitchen pantry like a pro. This post may contain affiliate links which means if you purchase we may receive a small commision at no additional cost to you. A few months ago we cleaned out our kitchen pantry, we just about emptied it completely out because it was at the point we couldn’t find anything and we mean anything. We were purchasing items that we already had 4-5 of because we didn’t know we had them. What a waste of money! 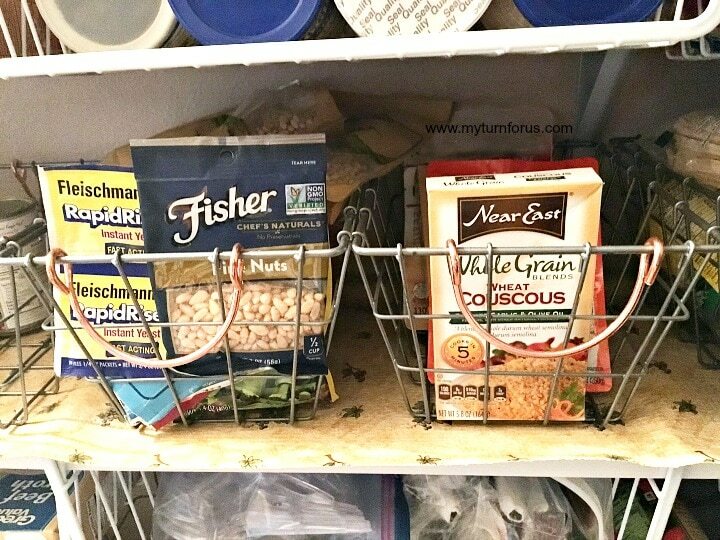 We started our kitchen pantry organization project by examining our kitchen pantry contents and then we gathered together baskets, jars and our trusty label maker and we made some additional purchases. Certain pantry items can be grouped together by uses, for instance, all vegetable cans together, all tomato sauces and diced tomatoes together. The goal was to never move anything out of the way to find an item that is different, that’s how things get overlooked and lost. All the bags of rice, pasta, and beans that take up space and get lost are placed together in another wire basket. Our pantry is not picture perfect, I’m sure those picture perfect kitchen pantries don’t stay that way very long. Our goal was to set up our kitchen pantry to stay organized with a minimal amount of work. We wanted it set up so when we return from the grocery store, everything new has a place and the groceries are put away quickly. We started by taking a day or so of our time and purchased a few new baskets, bins, jars and labels and started. Our pantry is now something we are proud of and we can find exactly what we need in just a second or two. It just took several creative tricks and a few extra purchases, and we will share some of our ideas today. 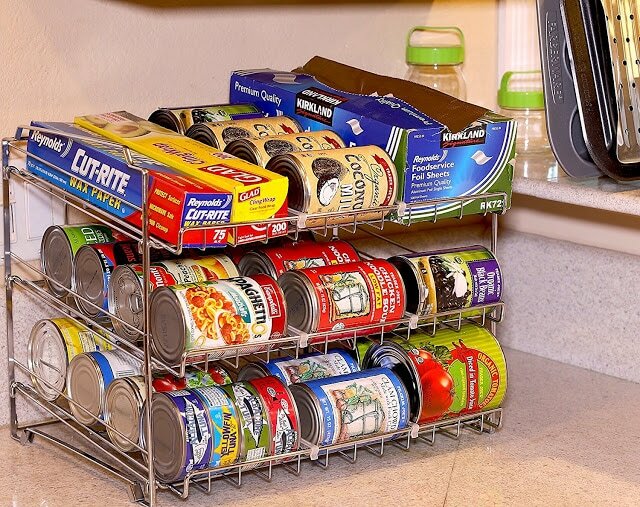 This can goods organizer works very well, you can store up to 36 cans and the dividers are adjustable for different can sizes. And several can be ordered from Amazon and stacked. 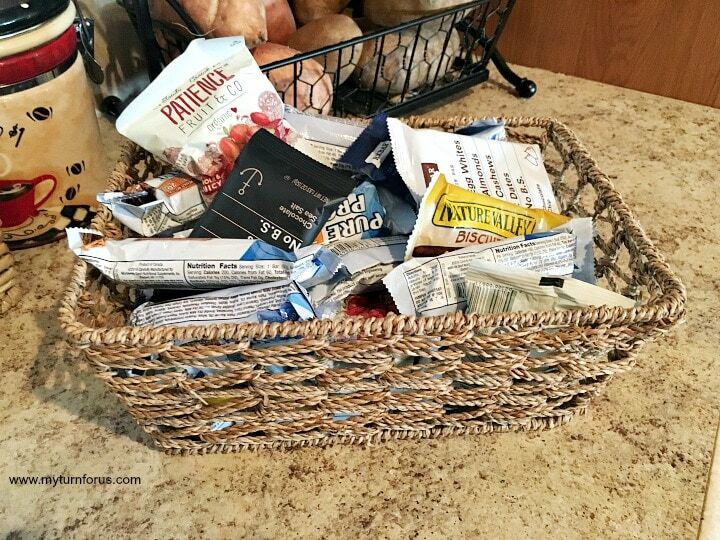 We bought several of these “Under the Shelf Wire Baskets”, and they were a lifesaver in our pantry organization plan. The top bar slides onto the top of the current shelf and this basket hangs underneath. These are perfect for those little boxes of jello, paper plates, dinner napkins or coffee filters to increase your pantry storage ability. Smaller baking items like baking soda and baking powder are placed conveniently under the flour and sugar canisters. Other small items that seem to get lost are easy to find with these under the shelf baskets. 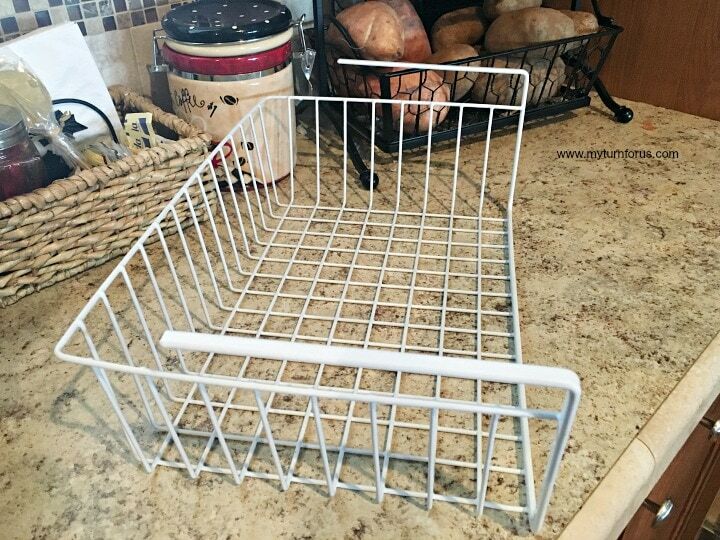 We also purchased several of these Wire Baskets, there are perfect for those little boxes of rice, mixes and sauce bottles. 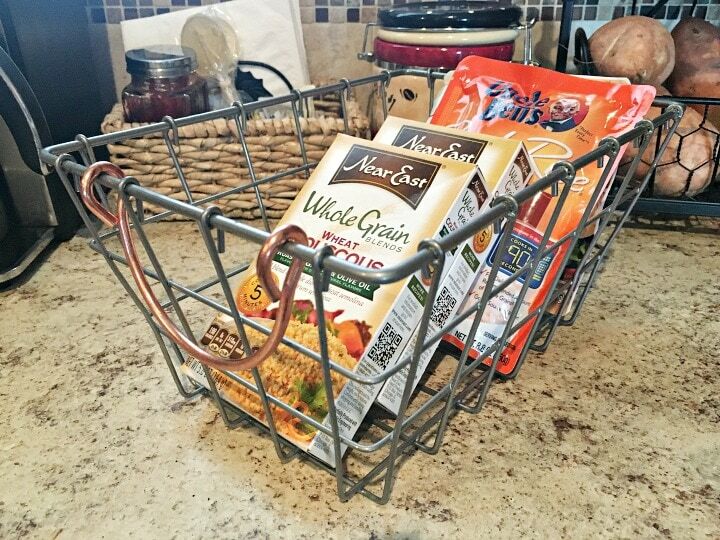 Using the wire baskets, everything is visual and there is no need to “dig” to find what you need and I love the copper handles, makes my pantry look a little more personable. You can find them on the Target website right here. Since our pantry shelves stopped about 30 inches from the floor, we added a couple free-standing shelving units from Shelving.com. to increase our storage ability. These shelves come in several sizes and we purchased a couple to fit completely underneath the current shelves. 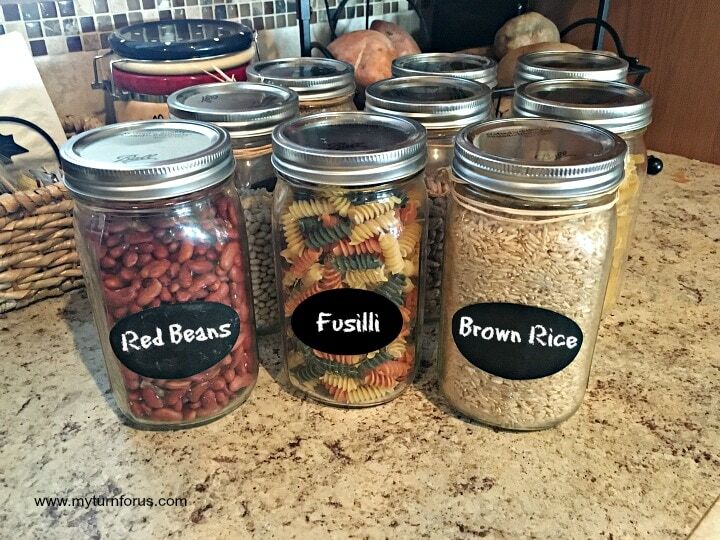 We also purchased several additional Mason Jars and filled them with beans, rice, and pasta. Mason jars are clear so one can see exactly what’s inside and how much is remaining, which it makes it easier to fill out our grocery list. Wide mouth quart Mason Jars are easier to pour and fill but regular mouth Mason jars would also work. 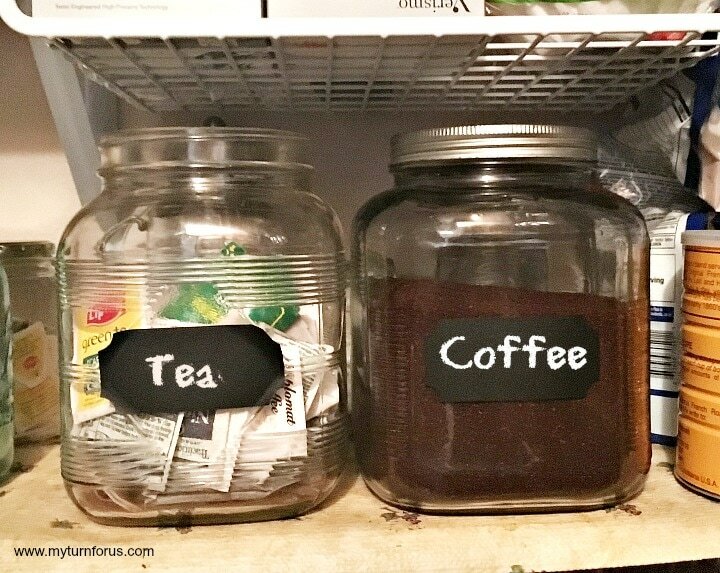 One way to organize your kitchen pantry like a pro is to clearly label all containers. 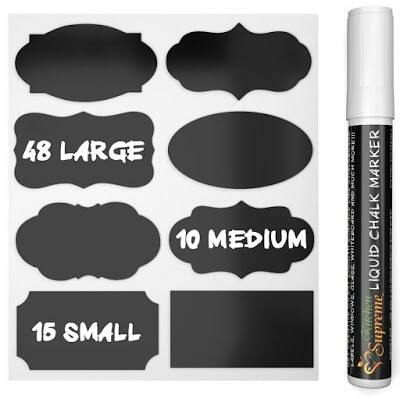 We found several different kinds of labels at Amazon but decided on these cute chalkboard sticker labels which come with a white chalk marker. I just love the way they look! But if you are looking for something more colorful or different then see these other choices on Amazon. 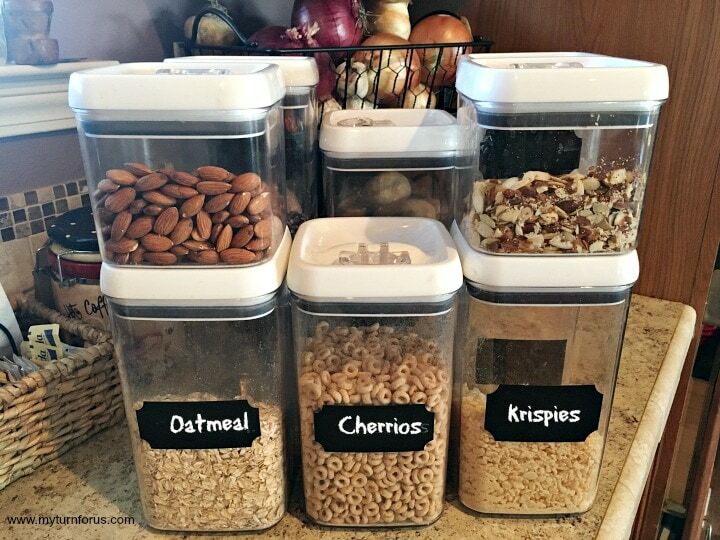 For Cereal, snacks, and chips we choose these 10 piece air-tight food storage containers. They have an airtight locking system with a silicone ring around the lids to keep that cereal and snacks fresh and dry. I love the way they are clear and we went ahead and added labels to those also. We used our chalkboard labels and simply printed out the name of the contents. But you could also use a label maker if it was a wide label maker. These darling Cracker Jars can be found on Amazon. 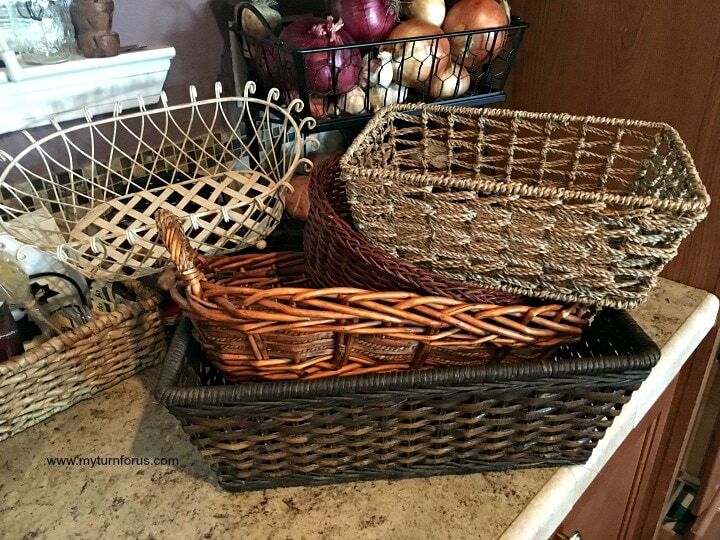 Last but certainly not least are baskets, straw baskets are awesome, they come in numerous sizes, shapes, and colors. You may already have several around your house that you could use. We used baskets to contain or corral our snacks, bags of chips, bread and other loose items. 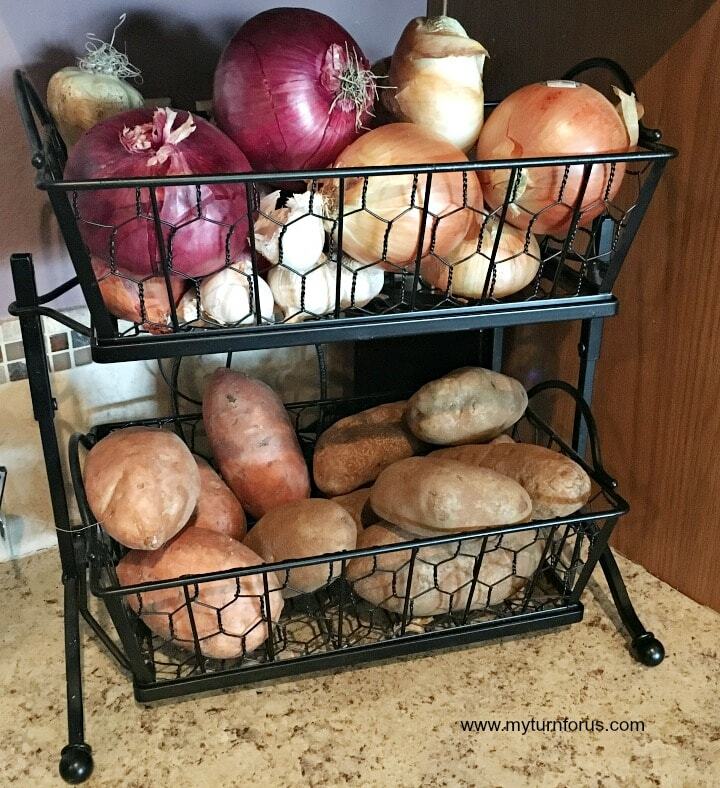 We keep our potatoes and onions in this Two-tiered Chicken Wire basket and Stand (from Amazon) right on the counter but it would be super cute inside the pantry. The only change we made was this basket comes with a handle on top and we left it off so it would fit more neatly under the shelves. Here are some of the other of our favorite places that we would recommend to find storage items. 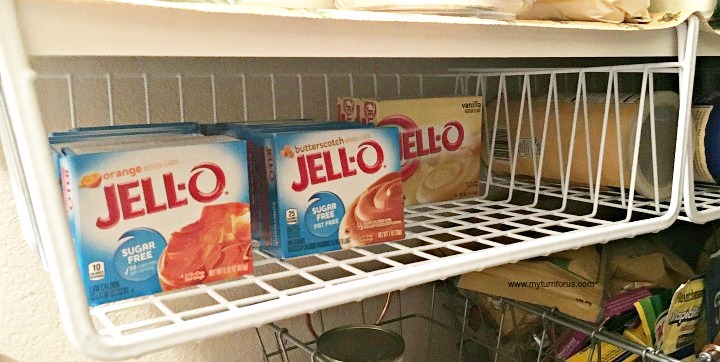 Using a few of these items you can truly organize your kitchen pantry like a pro. 1. Antique Farm House has some unique and creative baskets and containers that would rock your pantry. Just because it’s a pantry, it doesn’t have to be industrial looking, make it your own. When you enjoy your pantry, cooking and working in the kitchen is so much more fun. 2. I check almost every day at Decor Steals, they have daily steals that only last until they are sold out. If you are fast, you can grab some super cute galvanized containers, wire baskets, and farmhouse signs. We used a variety of containers, jars, and baskets to look more like a grandmother’s pantry. Our pantry has a personal feeling of a working kitchen pantry with a homey flair. Everything doesn’t have to match to make it awesome. We now have an organized pantry and we can find what we need quickly. You did a great job! I like that it looks organized, without looking like you might mess it up while actually using it. Thanks for sharing your ideas!